Well, it's that time of year again, when Saucy lifts her head from the groundhog hole to announce that spring is almost upon us! 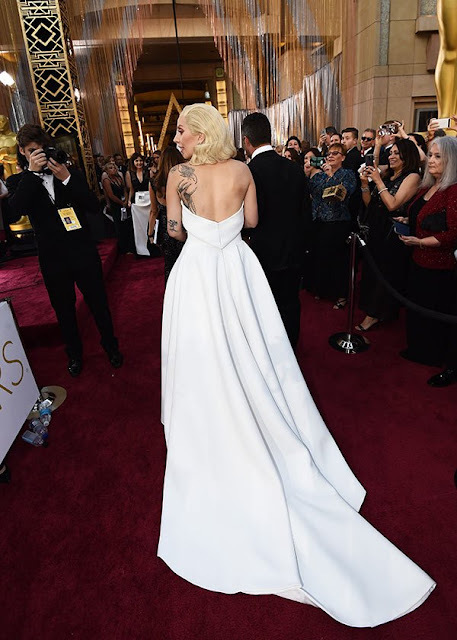 The Oscar dresses have been worn! Let's get at it, shall we? Alicia Vikander of The Danish Girl was one of the first nominees to hit the red carpet, wearing Louis Vuitton. Saucy is incredibly torn about this. Yes to the buttercup yellow! Yes to the bodice! Yes to the detail of silver sequin! No to the poufy parachute bottom skirt! Although it does look quite fun to wear, and she is contractually obligated to wear LV, the white gown they made for her to wear to the Golden Globes was infinitely better (below) and she should have worn the dresses to the opposite events. The white, slim fit gown would have been infinitely better to be seen immortalized in photos forevermore as an Academy Award winner! Anyway, The Danish Girl was a very good movie and Ms. Vikander deserved to win The Oscar for Best Supporting Actress. Congrats to her. You may accuse Saucy of being anti-Canadian pride for saying this, but she was not a big fan of Rachel McAdams' forest green minimalist thingy. She was styled well and it suited her figure, but the satin fabric had unfortunate wrinkles from the limousine ride and under the lights of the stage the paneling made some very unflattering shading. The Angelina Jolie side slit was just too, too much. This is a very polite way of saying, there were too many wrinkles in the crotch-al area and under the lights she appeared to have eaten several hamburgers prior to arrival. We all know this not to be the case, as all Hollywood actresses are on a strict water/cucumber/lemon/kale/chia diet. Let's discuss the purposeful bumps of the evening, shall we? Chrissy Teigen brought her awkward facial expressions to the awards again this year. The camera cut to her after the unfortunate Stacey Dash incident. At least she was well dressed! This ensemble is elegant in every way. Saucy only watches FabLife intermittently. There's an invisible line that Saucy should not cross regarding the critique of an expectant mother, but as she steps over it she will say: Dear Emily Blunt, your hem is too long. Your lovely hair should have been up. Your dress was... nice. Saucy did not see Sicario. She remembers The Devil Wears Prada with fondness and longs for the good old days. PS. This dress was by Prada. Go figure. There is a devil AT Prada. This is Oscar-winner Jennifer Lawrence's new look. Not entirely new, as she herself is contractually obligated to the House of Dior. It was no surprise that she wore this dress. It was nice to see her in black, and her minimal Chopard jewels were not distracting. How odd was the peplum on the back of the gown? Very. But Saucy saw Joy and it was a clever little film. This does not look like a woman who sold mops at Kmart. J-Law is pretty freaking fabulous, though. This is Joy Mongeau, the lady Jennifer Lawrence played in the movie. This also does not look like a woman who sold mops at Kmart. This is a woman who invented the Spin Mop, velvet Huggar Hangers, and other clever gadgets. She can now buy and pay for the designer gown she wore tonight several times over. She made a good choice with this halter-style beaded number. Joy is pretty freaking fabulous, though. Can we also agree, it's nice to see a lady hold her own handbag on the red carpet? It's so much better than having a handbag-handler off camera toting your lipstick around. This is Brie Larson, who also played a character named Joy this year. 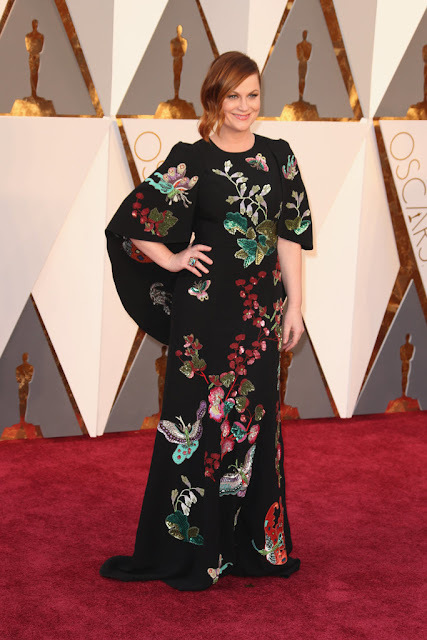 This is the Gucci gown she wore to accept her Academy Award for her role in Room. Saucy really feels strongly about the top of this gown being layered with soft tulle, and thinks it is so very flattering. The belt is beautifully jeweled. The skirt is just a very tiny, teeny-weeny too fluffy for Saucy's taste. The critics will rave about this dress tomorrow. Saucy has planted it firmly in the middle of her best-dressed list. Yes to the top, yes to the belt, yes to the colour. No to the ruffling. No to matching it up with dangly earrings and the odd hairstyle. Very prom. Very. Yes to Room. The movie and the novel. Isla Fisher looking pretty and springy. Isla Fisher surprising everyone (Saucy included) that she is still married to comedian Ali G.
Presenter Sarah Silverman, stunning in black. With her hair pulled back tightly, the comedienne looked so glamorous and so un-funny. She was wonderful in an un-funny in I Smile Back. Check it out on Netflix if you haven't yet. This is nominee Jennifer Jason-Leigh on this leg of her comeback tour. This is a beautiful dress with lovely detail, but it has been done and seen before. The colour is a tad bland and WHAT IS IT WITH THE HEMLINES THIS YEAR? Please ladies! When borrowing expensive gowns please have the hem adjusted for your height. The Hateful Eight was a good movie, Saucy and Veto made sure to see it on a full 70mm screen. Imagine seeing this pretty face splattered with all the fake blood Quentin Tarantino can throw at it *shudder*. We may agree to disagree... Saucy adored this look on Cate Blanchette. The silhouette, the nipped waist, the detail, the colour. Loopy felt that the shoulders were a bit "too fluffy" and took umbrage with some of the dangling sequins, but Saucy did not care... her Queen, Cate, can do no wrong in the fashion department! Queen Cate's Carol co-star Rooney Mara, wearing another one of the awkward outfits that appear a little raggedy this awards season. Saucy cannot feign to be so fashion-forward that she will approve of this dress for the Oscars. She will suggest it be worn by the likes of a Katy Perry-type for a show like The Grammys. Saucy did not see Carol, it was on her list and she could not fit it in. She will see it as soon as she can. She will never like this dress. Comedy sisters forever Amy and Tina, each looking fabulous! While some may say the large print is overwhelming for Amy's petite frame, Saucy says it is clever and stylish. While some may say Tina was "safe" and "took no risk" Saucy will say that these sisters were perfect fashion yin and yang tonight. Lady Gaga sure has come a long way since the days of sliced meat couture and for that, Saucy is glad. There can only be one small complaint that will keep her off the top of the best-dressed list, and it is the unfortunate pull of her decolletage. Otherwise, this pantsuit/gown combo is perfection. Pants in the front! Dress in the back! It's like a fashion mullet, but in a good way. Margot Robbie, Tina Fey's co-star in the upcoming Whiskey Tango Foxtrot (which Saucy cannot wait to see), channeling her inner C-3PO, but also in a good way. Folded, demure, covered up. This look is A++ gorgeous, right down to the beachy waved hair and the elongated tassel evening bag, which Saucy is glad the actress is holding for herself (not an evening bag wrangler). PS. Margot made an appearance in The Big Short, one of Saucy's favourite movies of this year. If you haven't seen it yet, see it twice. Kate Winslet, nominated for her role in the Steve Jobs biopic. This year's Steve Jobs biopic was so much better than the Ashton Kutcher-Steve Jobs biopic of last year (or was it the year before?). Kate's dress tonight was no better or worse than any of her previous Oscar gowns but Saucy did appreciate her trotting onstage wearing unsightly, oversized reading glasses that were placed klunkily on her pretty face. It just made Saucy very happy to see a glamorous movie star embracing the fact that one of her ears must be substantially higher than the other in front of 900 million people. How about Saoirse Ronan looking chic and shiny in Calvin Klien? Take note, Rachel McAdams, this is how you wear forest green from head to toe. Irish girls do it best! PS. Brooklyn was another of Saucy's favourite movies of 2015. Saoirse was a dream! Things are heating up... Saucy is revealing her absolute favourite looks of the night before she shares the fashion disasters. Charlize Theron is, as usual, one of the best dressed stars on the red carpet. Saucy is no fan of red dresses on a red carpet but in this instance Charlize can do no wrong (once again) and tops the list by a country mile! Thank you, Daisy Ridley of Star Wars: The Force Awakens, for bringing a fresh look to the red carpet. Not full length, not tea length. Not modern nor Edwardian. Just absolute perfection. The fashion force is strong with this one. Sorry/Not Sorry for obvious pun. Naomi Watts should be neither flogged nor flagged for this look, but her impeccable grooming, accessorizing and general styling deem her worthy of a spot near the top of the list! SEQUINS FOR EVERYONE. Dorith Mouth? The model? Not sure why you are here, the dress is very... Victorian? Saucy has little to say about this because she knows not who you are and therefore deems you irrelevant. She will say, if she saw this dress on the runway, or in the Kleinfeld Bridal Salon, it would make sense. Sofia Vergara, you are a lovely woman. This dress is appropriate, but matronly. You appear to be at sixes and sevens with your stylist... who told you to leave the house bathed in pixie glitter dust? It was blinding when you made your presentation. You are not a twelve year old girl and this is not 2004. You should not attempt to glitter bomb your shoulders, arms and chest before you leave the house. Is it fair to say that Olivia Wilde's look was ah-may-zing from the back and ter-rib-le from the front? It is. You can see why. It is late. Saucy does not need to explain. Her readers have eyes. Kerry Washington seems to think she has to constantly remind us she is "on the cutting edge of fashion" when in fact this dress should be on the cutting room floor. Olivia Munn, looking blah in tangerine... who looks blah in tangerine? 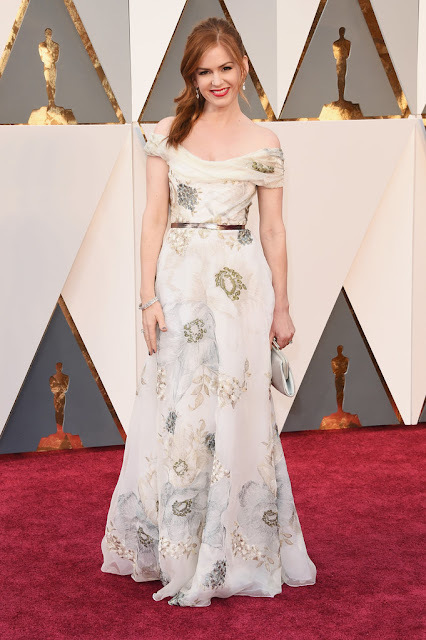 Nobody usually, but this dress is absolutely not Oscar-worthy, sorry. It is Emmy Awards at best. Slow claps all round for the bold colour choice, but Olivia needs to understand she's at the freaking Academy Awards, ditch the orange peel dresses, pronto. And ix-nay to the matching orange lip. Saucy has decided that Heidi Klum must be the worst dressed at the Academy Awards, 2016! She has out-dressed her past performances, all Disney fairy godmothers, and even Gaga's meat dresses of yore. This is a fashion disaster. Once again, dear Heidi we must bid you auf wiedersehen! The 2016 Awards Season has drawn to a close. Saucy was unable to cover every event on the blog due to traveling with Veto. She made every effort to be here on Oscar night to share in the snark with you. She hopes you enjoyed!